Okay, so a short back-story… we bought Brio in the middle of the desert. It really doesn’t rain much there, so leaks were not a concern of ours for the first ~2 years of boat ownership. But as we journeyed into the tropics (aka: the rainforest!) 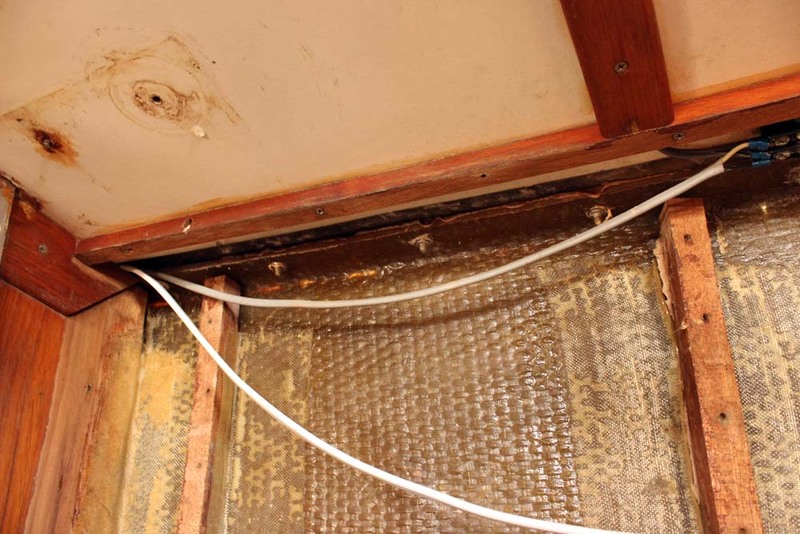 and experienced our first real offshore weather (aka: waves pounding on the deck, forcing seawater into every crevice, nook and cranny on the boat), we discovered *SURPRISE* that we had a few leaks. Well, actually, each side of the toerail has 60 bolts (with 60 corresponding holes), so “a few leaks” might be a little kind. In the wrong conditions, she leaked real good. 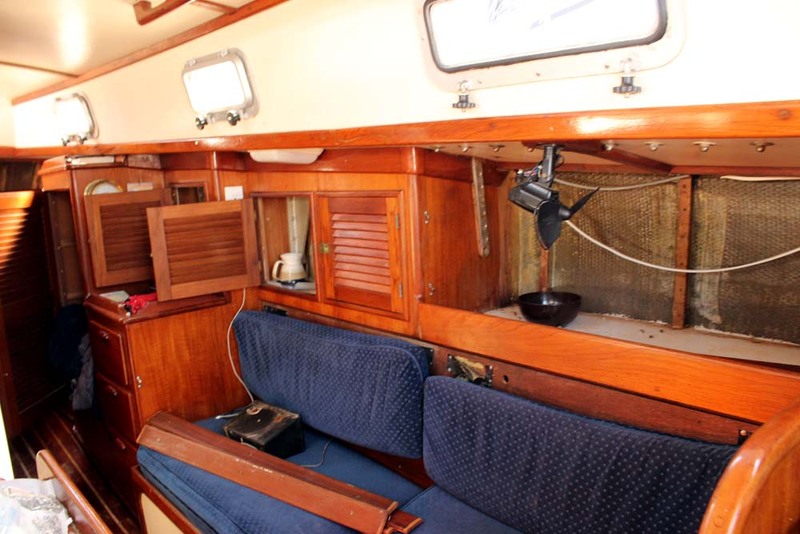 I have to say that watching disgusting salt water pour down the walls and into our clothes cupboard / electrical panel / bookshelf / floor MIGHT just be the most disheartening boat-related activity I’ve ever experienced. By the time we reached Panama we were desperate for a solution. Using what we had at hand, Jon smeared every bolt head and the edge of the toerail with some 5200, and this helped us make it to Maine with (fewer) leaks. Anyways, all this to say that this is a job we’ve been simultaneously dreading and looking forward to having done for a LONG time. It does mean that you might find yourself awake at 5am on a Sunday because you are DETERMINED to get this job done before the weekend is over, allowing some spectacular sunrise photos to take place that might not have otherwise. I should now confess that we actually did the first side a month ago. We spent the 4th of July watching fireworks while wearing headlamps and re-installing the very last few new bolts and nuts. It then took another month for us to feel ready to tackle the other side (including needing a non-rainy weekend to do the job!). 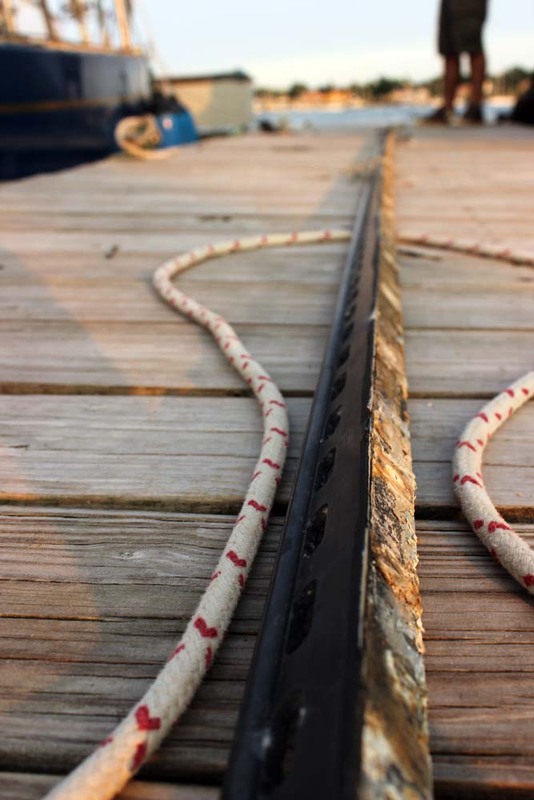 Now, on our boat the toerail bolts are also what hold the deck to the hull. A rather important job. 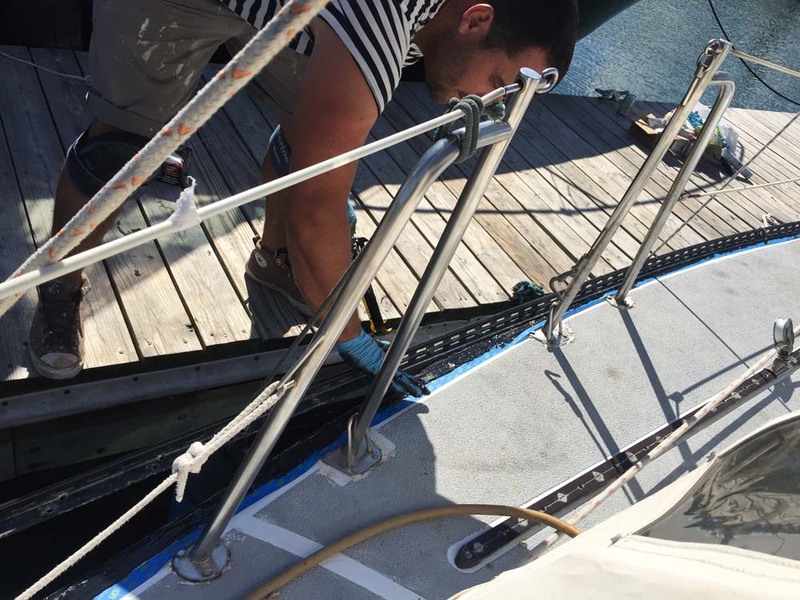 We had a hunch that our leaks might actually be coming from the hull-deck joint, so we made the executive decision to “pop” the hull-deck joint as we went, enabling us to clean out all the old / non-existent sealant and re-bed the joint with 5200. 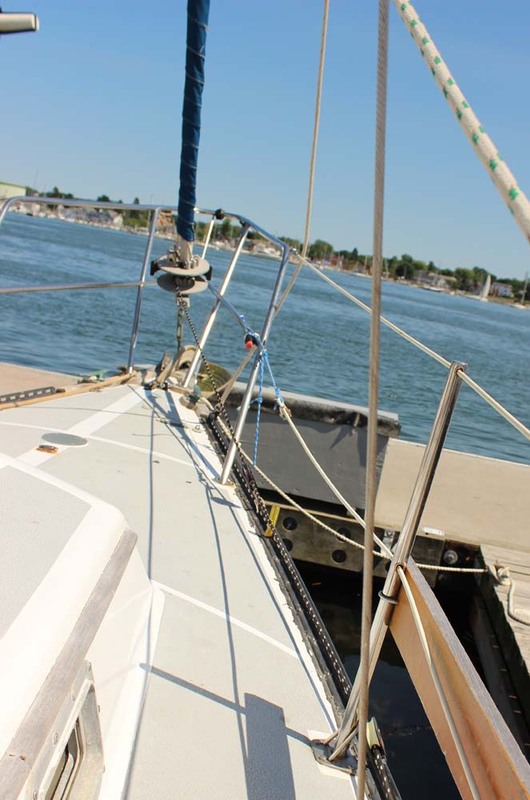 In case you’re wondering, popping the deck off your sailboat’s hull is FREAKING SCARY. As sunlight filtered in the now-open-gap, I definitely crossed a few fingers and said a few prayers that this wouldn’t be forever remembered as “the day we broke the boat“. 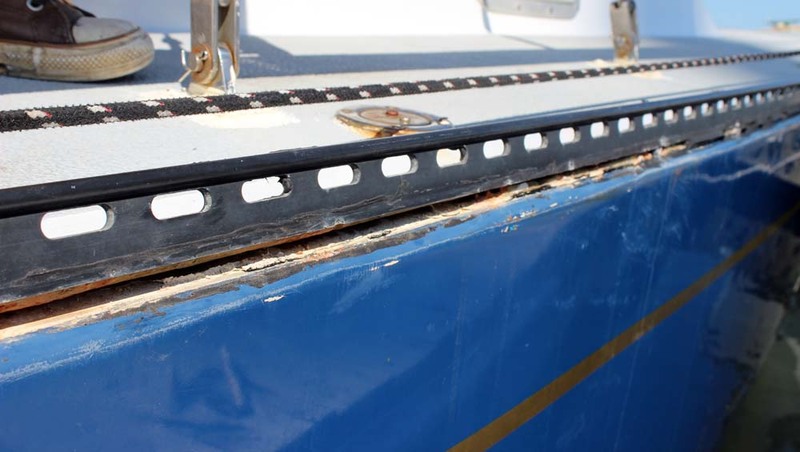 Thankfully we didn’t break the boat, and by opening up the hull-deck joint we were able to get a satisfying amount of 5200 all along the length of the boat’s joint, as well as between the toerail and the deck. 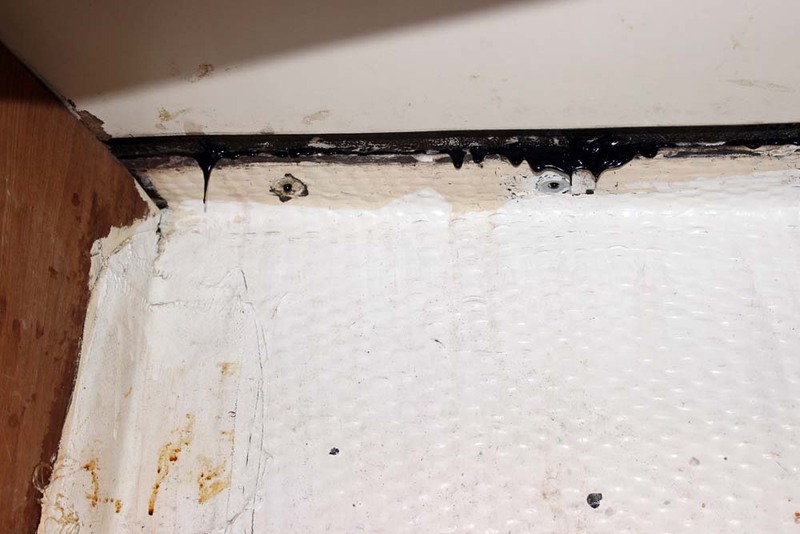 *How much 5200 was a question that we were very curious to discover; the article we were using as a reference noted that he used FOURTEEN tubes of 5200 (which, if you’re wondering, is also about $280 worth of sealant!!). This seemed like a crazy number to me, but in the end we did use 11 tubes. Quite a lot more than I would have ever guessed!! Oh and black 5200 retails for about double the price of white 5200, so that’s where my $$ numbers are coming from. 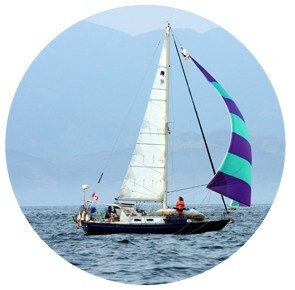 Loosen all the rigging. We read this was important to ensure the deck stays lined up with the hull, and we found that it was actually *super* important to be able to get the hull and deck joined up again too. Loosen those shrouds! Remove all nuts. This step is probably the most misleading… we got 59 nuts removed from the Starboard side in like 45 minutes… and then spent the next two hours fighting the 60th nut. In the end a nut grabber tool saved our butts on that 60th one. The Port side was quite a bit worse, with 4 bolts that had to be drilled out. Remove all bolts. Lots of the bolts came up nicely with a drill, but a good number had to be pried up with a screwdriver and scraper / fingernail / something skinny. 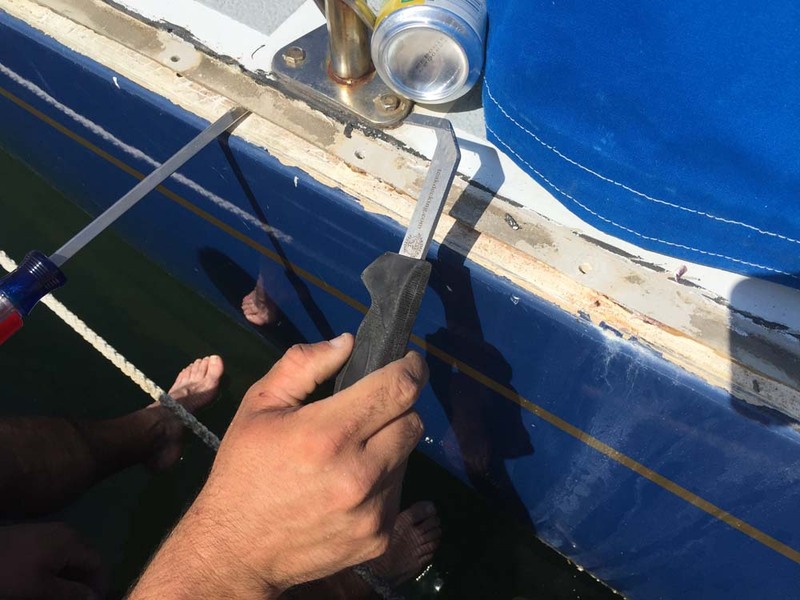 We tried to poke a couple screwdrivers back in the empty holes, for fear of the deck shifting off the hull… I think this was a good call, but maybe not as necessary as it felt. Peel the toerail off the boat. This is really fun. Seriously. You’ve been sweating inside a hot cramped boat for hours at this point, and the satisfaction of peeling that giant rail off is awesome. 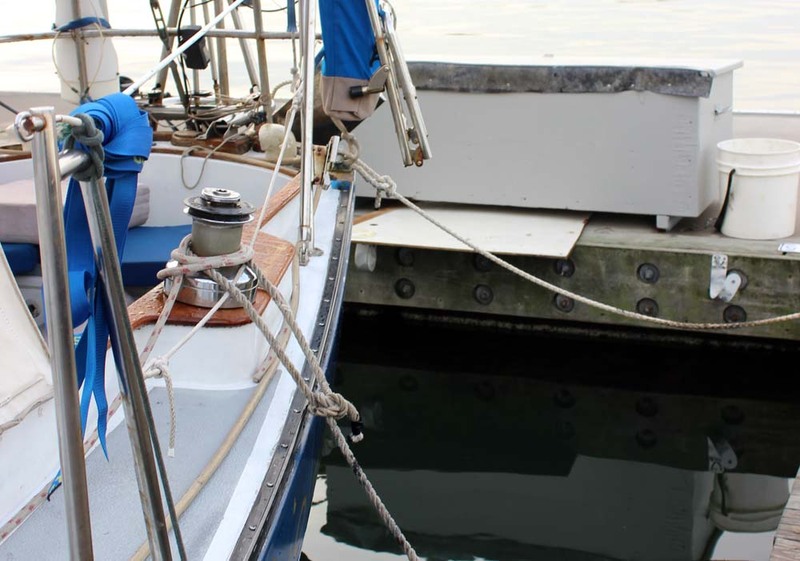 We loved the tip of connecting halyards to the toerail so it doesn’t spring off and land in the drink, and the halyards were also handy for re-positioning the toerail when it was time to put it back in place. Clean the toerail. 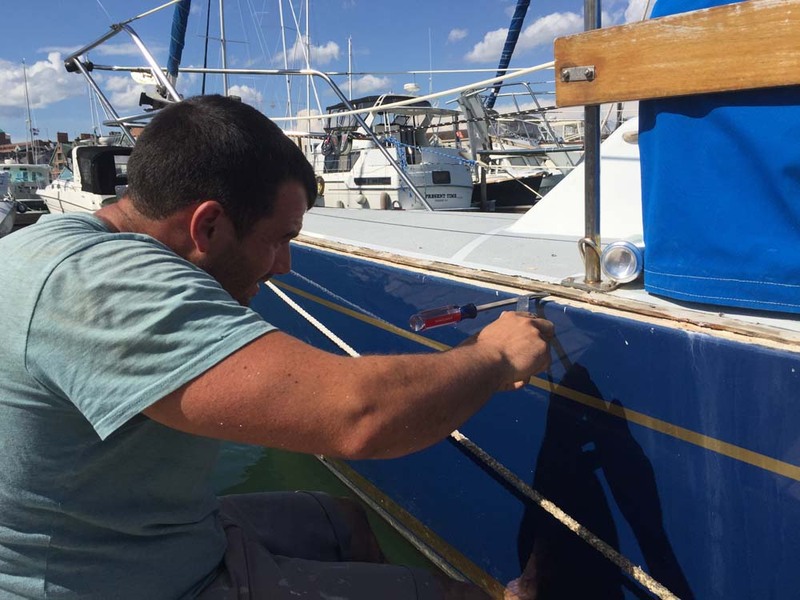 Clean the hull-deck joint. Clean the deck. This was by FAR the most time-consuming step. I’d guesstimate we spent approximately 8 hours (per side) just cleaning and scraping old caulking out. Eventually we found this caulking-removal tool and that made the job a lot more pleasant. Repair aluminum toerail. 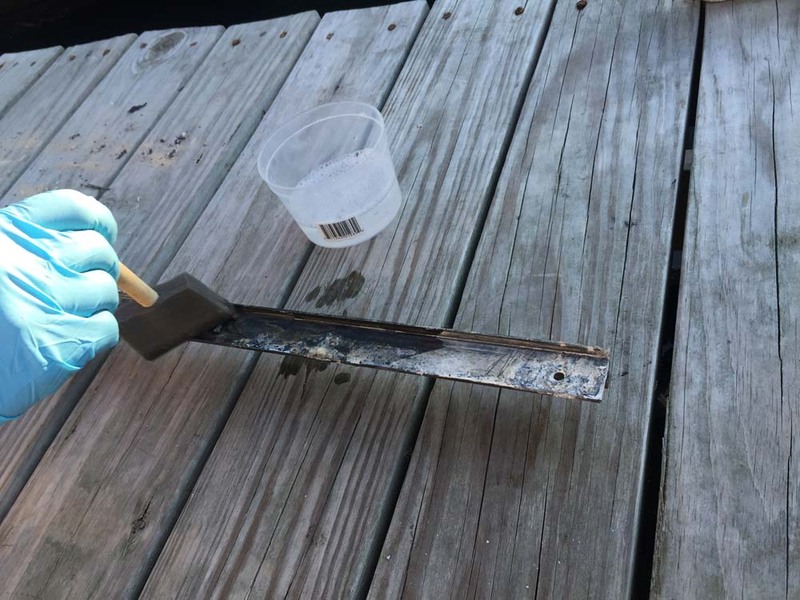 Our toerail had quite a few corroded spots, so we acid-etched any bare places and then applied 5-minute epoxy mixed with aluminum powder to the worst places. SIDE NOTE: 5-minute epoxy is my new FAVOURITE product in the entire world. Although I’m pretty sure it’s West Systems pulling a fast one on us with a 1:1 ratio of epoxy + hardener, the convenience of epoxy that actually sets in 5 minutes cannot be over-emphasized. Madly scramble to tape up the 60 holes in your boat while a brief rain shower passes through. Try not to cry. Admire the black duct-tape and comment that maybe it’d be easier to just leave the toerail off and use tape instead? Get back to work. Clean and wipe down all surfaces. Acetone is your friend. Tape newspaper inside every cupboard. 5200 on a warm day is goopy stuff, and it definitely ran through the hull deck joint in MANY places. Have a giant glass of water and a pee and a snack. You really can’t stop once you start the next step. 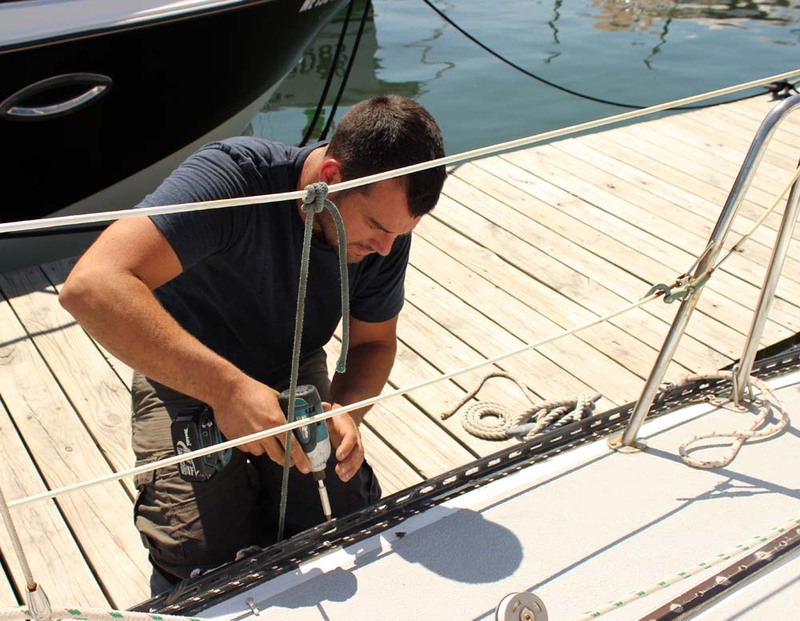 String up the toerail at deck level. 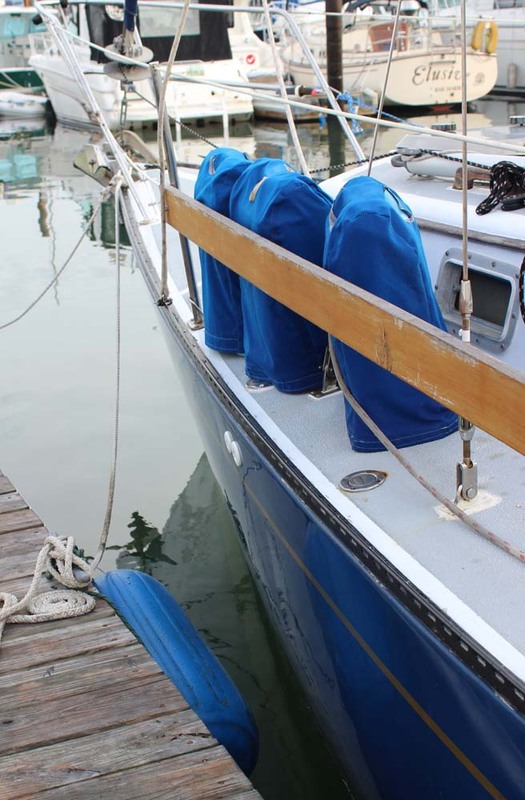 Two halyards did this job well. Apply 5200 to approx. five feet of the hull-deck joint and the deck. Brio curves enough that we could goop up around 5′ without the entire toerail getting covered in black gunk. Get the first bolt in. In our case, the first five “bolts” are actually screws that go into a tapped aluminum plate, so that made the first section of toerail relatively easy to get realigned. More goop, bolts, washers, nuts, struggling. Tighten loosely (aside: is “tighten loosely” an oxymoron?? or just a weird thing to say…). 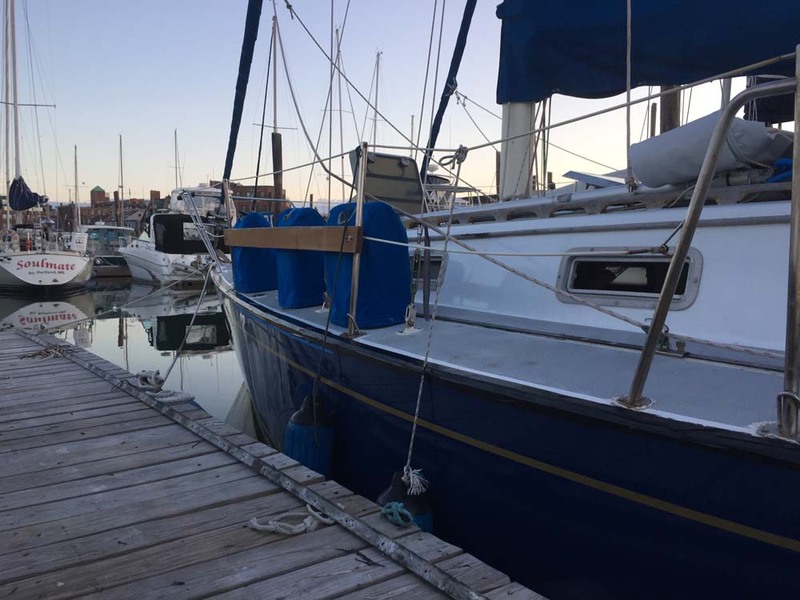 We’d continue with another 5 feet of bolts, then go back and tighten down the first 5′ section… trying to get the 5200 to seep through the hull deck joint nicely (which it did). Fold into a pretzel. Why is it that the last 5% of a job is always the hardest?? To put nuts on the last couple bolts took a little creative manoeuvering. Wipe down excess 5200. As everything runs and drips and seeps, you end up with 5200 kind of… everywhere? We eventually realized that scraping up the excess 5200 sooner than later made for a cleaner job. Remove the tape. Don’t leave it overnight. It might SAY that it won’t be tack-free for at least 24 hours, but it’s lying. 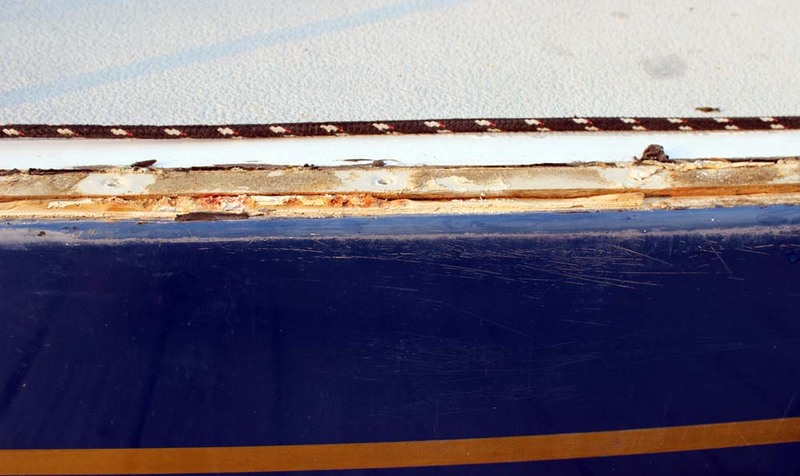 We left the first side’s tape on for… too long… and ended up having to slice a clean line with a razor to get the tape to peel nicely #boatlessons. 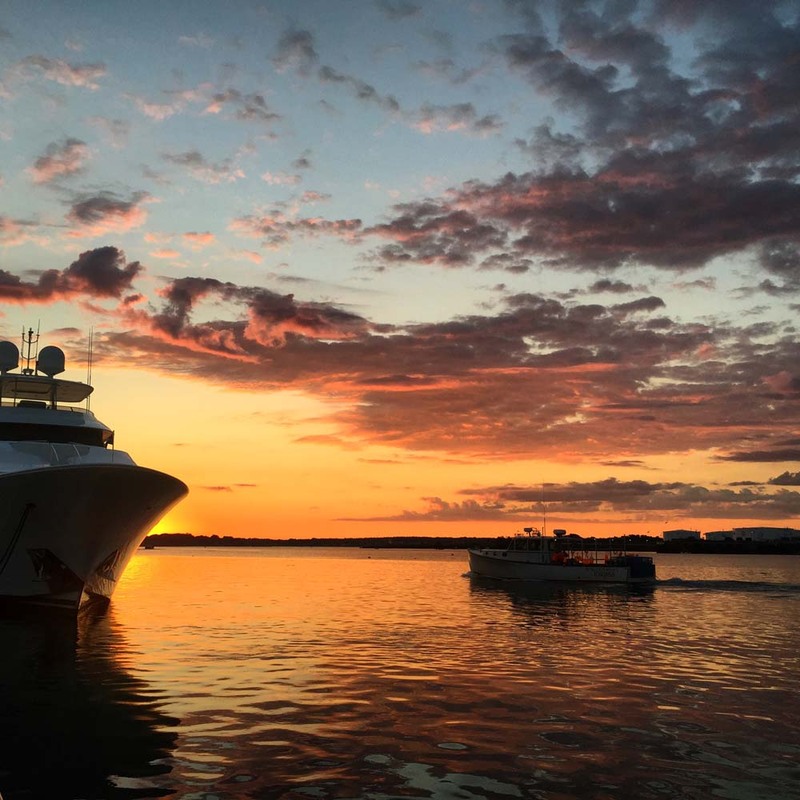 Stand back and discuss how the boat looks exactly the same as it did before you started this job. Maybe we should have just varnished some stuff. Continue discussion with multiple iterations of ‘do you think it will still leak?!?’. This does not get old. Put the darn boat back together. This is the “forgotten” step that is happily waiting for you just when you’re ready to shower and celebrate a job well done and sleep… and then you realize your bed is covered in teak boards and you haven’t seen the settees in at least 48 hours. Why is it that re-assembly is so much less satisfying than disassembly?? We rebed Tao’s toe rail too- though we didn’t do the whole project like you. Got some cool tools for pulling all the old caulking out as well, left the bolts in and re-caulked both outside edges. It worked amazingly well for not having been the whole job that you did! NICE WORK and wonderful write up. Great guide for the less handy types like myself. Thanks for taking the time to put it together! Well…..does it still leak????? Don’t leave us hanging. Hey thanks for posting. I am doing the same job now, but I will be using 4200 or 4000. 5200 you should put on something that will never need to come off. Toe rail, may indeed need to come off again.